We’d taken the back road to the Greek temple of Segesta and were bumping along on a pockmarked stretch of gravel. Outside the van window lay Sicily in the raw: towering craggy mountains, weathered farmhouses, the occasional flock of sheep, and vast geometric patterns of vineyards and melon fields and charred remains of wheatfields. “If you want to see the real Sicily, this is it,” Claudio said from behind the wheel, addressing the group who had come with us for seven days of trekking and winery-going. He was right. 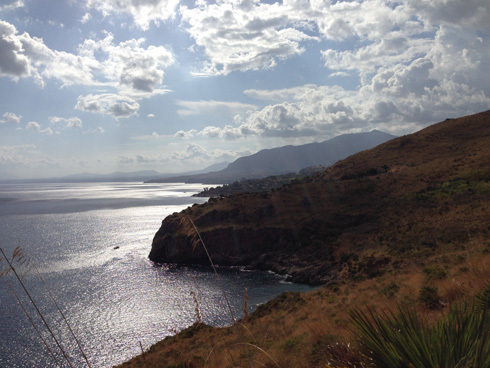 The places we go during our SICILIAN SAUNTER tour can only be described as authentic: rugged nature reserves, an agriturismo hidden down a long, unmarked road that offers a quintessential Sicily lunch, a boat ride with the jovial Capitano Franco, a home-cooked meal with a scruffy nobleman turned winemaker—and, yes, those bumpy back roads that take you to the beating heart of this unique place. Because the tour sold out, we added another departure and did two Sicilian Saunters back to back. So I came away with a lot of photographs. Here’s a selection from the combined tours, 98 shots that give a good sense of what Sicilian Saunter has to offer—the people, the hikes, the wine and food, the fun. We had a good time. Click here for the SICILIAN SAUNTER 2014 photo album.